Home » LOMB, CARL F.
Probably the son of the founder of the Bausch & Lomb Optical Company. 1928, New York. Temporary Certificate for 100 shares. Blue/Black with red overprint. 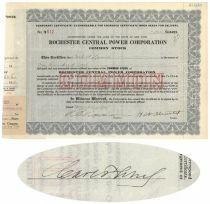 Issued to and signed on verso by Carl F. Lomb son of the founder of Bausch and Lomb serving as the company's president. Very fine condition. Light punch cancellations not affecting Lomb's signature.